Wow! I am completely honored and excited! 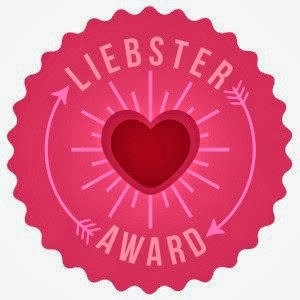 I was recently nominated for the Liebster Award! 1. I talk in my sleep... I’ve been known to randomly shake my husband awake during the night and say completely off the wall things like "Hey, I’m sorry about the time I told you I was standing there" and "They’re here… They’re here to vacuum out the car" and then not remember it the next day and he’s all like "???". Haha. And yeah I still have no idea what that first one means lol. 3. I love Christmas. I would probably move to Who-ville if I could. I listen to Christmas music all throughout the year. The Carpenters Christmas album is the BEST! 4. I grew up in a very musical family. I sing and can play the drums. My Dad and brother play pretty much everything and my mom plays the piano. My Dad owned a professional recording studio when I was growing up and recorded musicians from all over the world. Also I used to be the worship leader at my church in Missouri before I moved. 5. I love pasta so much that for years my family has called me "The Pasta Queen"! 6. I’m a big sports fan. I love ice hockey, and from about age 11 to about age 16 my dream was to become the first woman to play in the NHL, even though I’ve never actually played hockey in my life besides just street hockey with my siblings (lol). I like baseball and I completely do not understand football at all, but I like eating ice cream while watching football with my hubby (haha). 7. I love leftovers. I'll eat on them for the longest time... my hubby on the other hand hates leftovers. lol. 9. I think big cities are most beautiful at night. Though I think St. Louis is beautiful any time of day. 10. I hate telling people my fears. It kinda makes me paranoid. Lol. 1. Do you have a hidden talent? If so, what is it??? I make really good animal sounds, lol... chickens, squirrels, sheep, owls... needless to say, the list goes on... lol. 2. What’s your fashion style?? I kind of base my clothes on what mood I’m in every day haha, but lately since having a baby and also because I’m breastfeeding I look for comfort and functionality. Overall though I would have to say my style is very girly, classy, comfortable... I don't know that I really have one particular style. I think variety is good. 5. Where are you from? I grew up in rural southeast Missouri. 6. I know we all have dreams, so what’s yours?? I would love to attend a culinary school and open a restaurant with my husband. 7. Are you a Craftaholic like me?? If so what do you enjoy the most??? I love pretty much anything that calls for a glue gun or glitter (or both) haha. I also really love painting. 8. What made you open a blog? I can't really pin-point exactly one thing honestly, a combination of a lot of things I suppose. I've always enjoyed writing, its almost like a journal in a way and will be fun to look back on in the future,. 9. I am addicted to collecting quotes (I have a book filled with them) so what’s your favorite quote??? "She took a deep breath and let it go". I sometimes worry about things in my life that don't need worried about or that nothing can be done about and I found this quote recently and its helped me just relax a little bit more so that when things get crazy I just take a deep breath and realize that most the time when I have a bad day that its usually not going to matter a year from now or even next week from now, and if it does then it just does, because then its usually something that nothing can be done about at the moment, if ever. 10. If you had to describe your life in one word what would it be?? Uuuuuummmm... lol that's not the word I would pick but honestly that's an extremely deep question, I really don't think I could narrow my entire life down to just one word. Lol. 1. If you knew you were going to be suddenly stranded on a desert island, and were only allowed to bring one item, what would it be? 2. As a child, what did you want to be when you grew up? 4. Are you an outdoor or indoor person? 5. What made you want to start writing a blog? 6. If for one day, you could have unlimited access to the closet of your style icon (real or fictional), who would it be? 7. Do you think the early bird gets the worm? Or are you a night owl? 8. Where is your favorite vacation spot or place you would most like to vacation? 9. Favorite food to make? And favorite food to eat? 10. Favorite book? Or movie? 11. What is your all time favorite craft that you have made during your lifetime? 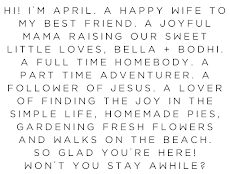 Thank you SO much for nominating me, April!!! :-) Loved reading your facts!